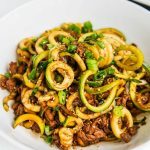 When it’s hot out, I crave foods like these Cool Noodles with Green Pesto and Sweet Spicy Soy Sesame Dressing for lunch or dinner. 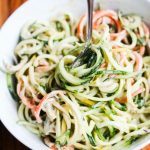 Keep some cooked noodles, pesto, and soy sesame sauce in the refrigerator, and toss this noodle salad together whenever your heart desires. When the peak of summer heat hits, I crave cool noodles, especially of the Asian variety. 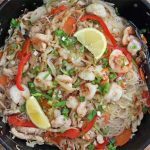 I’ve got a repertoire of Asian noodle salad recipes I reach for, but I’m always looking for new combinations. 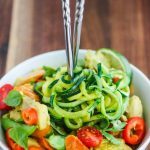 Today, I’m sharing a recipe I made recently that combines summer’s freshest produce in the form of a green pesto with a sweet and slightly spicy Asian dressing. 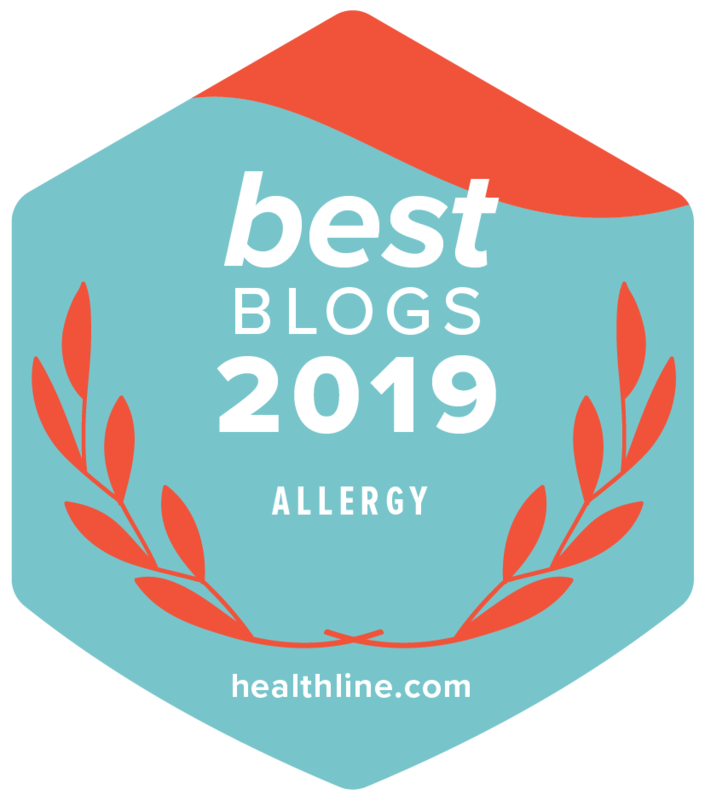 I’ve almost always got a jar of pesto in my refrigerator during the summertime – it’s my favorite way to get those leafy green vegetables into my kids’ meals without a fuss. Pesto goes down easy in kid meals, especially when it’s tossed in with pasta. Some egg crepe strips add protein for a vegetarian option, or you could toss in some leftover poached, roasted or grilled chicken. Feel free to add other seasonal vegetables such as radish kimchi, cucumber banchan or napa cabbage. Although I used Kale Basil Mint Parsley Pesto when I tossed this cold pasta salad together, any pesto will do, preferably the sort that has Swiss chard, kale, or some other leafy green blended in. What’s your favorite cool summer food? Mix together Sweet Spicy Soy Sesame Dressing ingredients. Stir some dressing into Pesto to loosen it up. Toss cold, cooked pasta with some of the pesto dressing mixture. Drizzle with more Sweet Spicy Soy Sesame Dressing to taste. Serve with red peppers, scallions, and egg crepe strips. Any kind of cold noodle salad is going to be right up my alley. 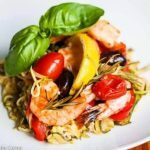 I’m a pasta guy and can’t get enough of it… I love that you do a combo of different greens in your pesto. The mint is so refreshing in there. 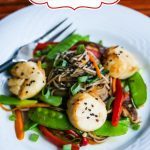 Brian – I’m with you…cold noodle salads are the way to go this hot summer! I love making pesto out of whatever’s in season – mint is my new favorite addition. It’s so hot and humid in Japan and we’ve been eating noodles every lunch! I want to make this pesto! Sounds delicious!!! Thanks Nami, stay cool! 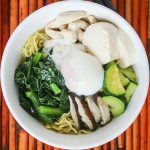 Love seeing your cold Asian noodle recipes too! 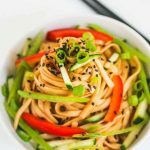 Cold noodle salads are one of my favourite summer lunches from childhood! Even these days, nothing’s quite as refreshing and filling at the same time. I like your addition of pesto—I’ve never thought of that! Mine too Irina! 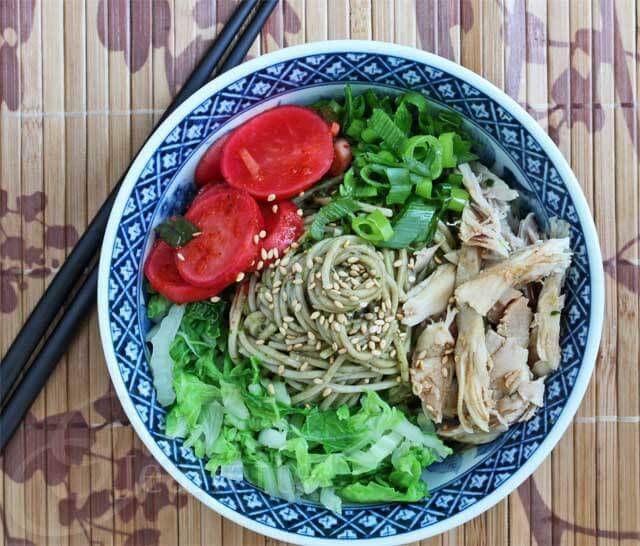 I grew up in heat and humidity, so cold noodle salads were always served throughout the summer. The pesto mixed with an Asian dressing is my latest concoction to try to get some summer greens into our meals. 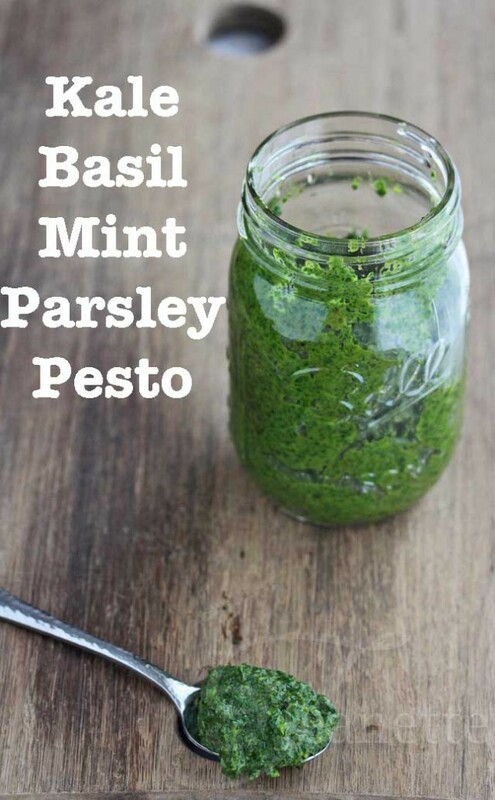 Kale Basil Mint Parsley Pesto sounds fantastic, what a great idea! oooh yum! I have some kale in my fridge right now!! Thanks Sommer, Sylvie, Kelly and Cheryl – I get lots of kale in my CSA Box during the summer, so I’m always coming up with ways to use it up and sneak in more greens in my kids’ meals! I’m so intrigued to try the combination of a your kale pesto and soy sesame dressing. This is something I could eat each and every day. Thanks Dara – this combination actually works really well. I know it might sound a bit unusual, but the boys enjoyed it. Ooh! 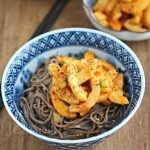 I have a container of basil walnut pesto in the fridge, and some eggs, soba, cucumber and orange bell pepper on hand – I’ll definitely be trying this tonight! 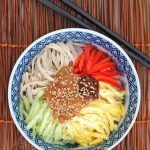 The Sweet Spicy soy dressing is new to me – I never would have thought to put it with the pesto but it looks delicious! 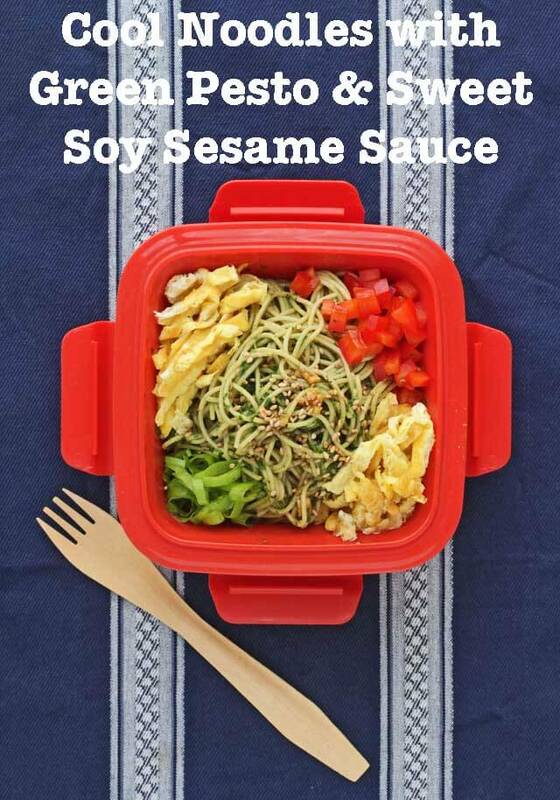 Thanks Sara – I hope you try it with the sweet soy dressing! First of all – congratulations Jeanette! Love this recipe. Thank you. Have a wonderful day. Thanks Liz – always love seeing your stop by to say hi! I want to provide a low fiber pasta salad to allow for the dietary needs of a member of our party. Does this recipe fit my needs? Diana, the pesto has fiber in it from the vegetables, but you could simply use the soy sesame dressing and serve with low fiber pasta. The shredded egg crepes would be nice on top, and perhaps some lettuce if you can include that in your low fiber menu.